For this month’s issue, Masterchef NZ runners-up Nikki and Jordan Shearer take inspiration from Turkish sharing plates known as mezzes. Middle Eastern food can be heavy and plentiful, so you need to counterbalance it with light, refreshing dishes that cleanse the palate and aid digestion. This is just that kind of dish. It is the perfect way to start a meal providing a lovely fresh flavour and it looks beautiful, too. The lightly sweetened dressing works well, counteracting the sharpness of the feta. Best served in the middle of the table for sharing. In a small jug, combine the yeast, one tsp sugar, and water. Stir to combine and leave to activate. This should only take five minutes and will create a foamy surface. In a large bowl, add flour, salt, and olive oil. Pour in the yeast liquid and stir to combine. Using your hands, bring the mixture together until it forms a dough. Turn out onto a floured surface and knead for five minutes. Place into an oiled bowl, cover, and leave in a warm place to rise until it doubles in size. Knead again on a floured surface for five minutes. Divide into six to eight pieces and roll out flat. Place on a lined baking tray, cover, and leave to rise again for an hour. In a dry pan over a medium heat, cook the flatbreads until crisp on the outside and soft on the inside. Combine all the washed herbs onto a serving plate. In a small pan, add ¾ cup sugar and water and bring to a boil. Reduce the heat and simmer until the sugar dissolves and the mixture thickens. Add vinegar, lime juice, and kaffir lime leaves and simmer for a further four minutes. Remove from the heat and add mint leaves. Leave to cool and just before serving, remove the mint and kaffir lime leaves. 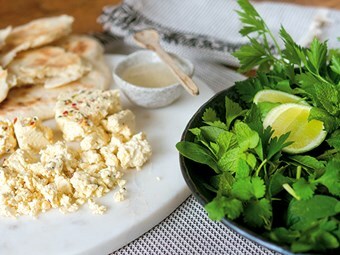 Crumble the feta onto a serving plate and tear the flat breads into pieces. Drizzle the dressing onto the herbs.